For all endnotes, please see the PDF version of this paper. As the birthplace of public education, Massachusetts has long believed in the promise of schools to advance opportunity and civic engagement for all. However, there is reason to question the level to which education today is delivering on this promise for all children across the state. Students facing family, health, and economic challenges enter schools with complex barriers to success. These barriers include frequent movement between schools, housing insecurity, hunger, and family stressors such as interaction with the child welfare or criminal justice systems. All of these challenges are linked with poverty and disproportionately affect communities of color.1 Policy discussions often overlook these barriers, yet they constrain the effectiveness of many educational strategies. Educators have struggled with the question of whether school structure or external factors, such as poverty, better explain achievement gaps. Rather than taking a narrow approach, a set of promising models has taken both external and school factors into account, intentionally confronting non-academic barriers while also providing strong academics. There are numerous terms for these efforts, including community schools, full-service schools, integrated student supports, and wraparound services. The term wraparound services is how we refer to them throughout this paper. Wraparound services are student and family supports integrated with and often delivered directly within schools.2 Wraparound services help schools address social and non-academic barriers to student learning. Wraparound services have the potential to help children, families, and teachers alike. The theory behind wraparound services suggests that students whose health and wellness needs are attended to will be healthier, more focused, and better able to learn. Similarly, families engaged with schools and supportive services will have increased capacity to support child learning and health. Finally, for schools, having additional systems for confronting social challenges that impede learning, will allow teachers and administrators to focus on instruction. Well-designed wraparound programs provide some services directly within schools while providing others through careful coordination with external agencies. This is an important balance to strike. Providing comprehensive services inside schools may be logistically challenging or duplicative of existing programs. However, merely referring students and families to outside providers may not meet immediate or ongoing needs as effectively as offering services in the schools that see kids and families on a daily basis. The following discussion excludes some services that are also important to child development. For instance, we do not analyze teaching and learning occurring throughout the school day, afterschool, extended learning time, pre-kindergarten, or social services not integrated with schools. For more information on providing pre-kindergarten to all three- and four-year-olds across the Commonwealth, see MassBudget's Building a Foundation for Success. A future paper in the Roadmap to Expanding Opportunity series will examine options for increasing learning time. Wraparound services have been around for over 30 years. One of the first efforts to provide them was under the umbrella of "community schools." Beginning in the 1980s, groups such as Schools of the 21st Century in New Haven, Connecticut, the Children's Aid Society in New York City, and the West Philadelphia Improvement Corps implemented school-based social services.3 These schools hosted community centers, provided health services, built family supports, and leveraged partnerships with business and non-profit groups. It is challenging to isolate the effects of wraparound services from the effects of schools themselves. A frequently cited 2011 study of the Harlem Children's Zone, done by Will Dobbie and Roland Fryer, pointed to high performing schools, not wraparound services, as the driver of impressive educational gains. However, Harlem Children's Zone schools feature wraparound services as defined here, including wellness and nutrition programs, mental health, medical, and dental care.6 It is unclear whether the impressive results of these schools, including closing racial achievement gaps within several years, would be possible without wraparound services. With a wide variety of services in operation, it is useful to look at specific initiatives that have achieved strong results. These organizations can inform the development of wraparound services in Massachusetts. The following section explores specific details about three high-performing models, operating from local to state scale, and discusses their outcomes. These case studies span wraparound services provided through a non-profit agency, school district, and a statewide initiative, displaying the diversity of the field. The expansive range of supports includes a wraparound director, family resource center, adult education, job training, medical and dental care, preventative health education, social workers, and mental health counselors.12 CAS also includes an extended day schedule and early education services through Head Start. Evaluation results for Children's Aid Society, particularly the original sites, have been encouraging. 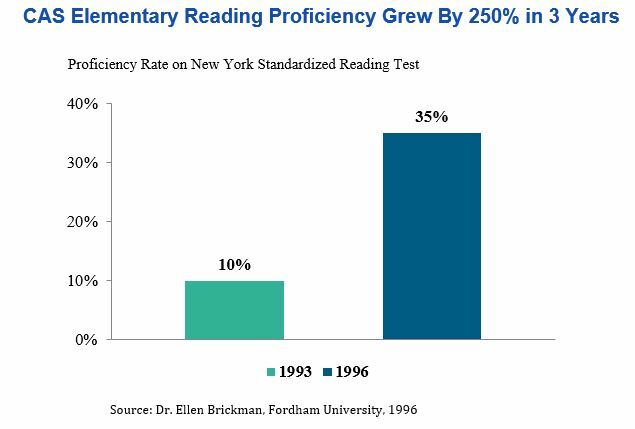 A Fordham University study indicated that CAS elementary students achieved proficiency growth ranging from 143 to 250 percent in math and reading scores between 1993 and 1996.13 This study also documented other positive effects including increased attendance, higher parent involvement, and improved access to health services. A cost-benefit analysis of Children's Aid Society also showed a strong return on investment. A 2013 study by the research firm The Finance Project showed a 10-to-1 return on each dollar invested in the first CAS elementary school and a 15-to-1 return for the first middle school site.15 The benefits arose from academic performance, health and wellness improvement, teacher retention, and parent involvement. This analysis included the entirety of Children's Aid Society services including early child care, thus the value of the wraparound services as defined here is likely somewhat lower. The Tulsa Area Community School Initiative (TACSI) has also demonstrated success with wraparound services. In this case, the lead agency is within a public school district. TACSI has shown the potential to help lower income students perform on par with higher income peers in math, while drastically reducing gaps in reading. However, it has achieved these results only in its developed sites, covering one-third of sites overall. TACSI began in 2007, reaching over 9,000 students and their families in 18 community schools across the Tulsa and Union public school districts in Oklahoma.16 As of 2012, TACSI had expanded to 23 schools.17 TACSI founders convened an array of youth service and child welfare agencies involved with the public schools, aiming to replace fragmentation and limited impact with holistic strategies to enhance academic, family, and health outcomes. TACSI shares similarities with other wraparound services. Site coordinators work in tandem with a management team including families, community partners, and school staff. The site team collaborates to assess needs and priorities, giving each school site a unique mix of offerings. Although specific services vary, they include youth development, family support and engagement, and health and wellness supports. TACSI also provides medical services open to students and families in the district. TACSI collaborates with a local Department of Health to provide health classes, prevention programs, and additional social workers.18 Other partners provide specialized services such as home visiting, job training, adult education, and counseling services for youth with incarcerated parents.19 TACSI partners supplement the work of existing school social workers and counselors, significantly reducing caseloads for district staff. 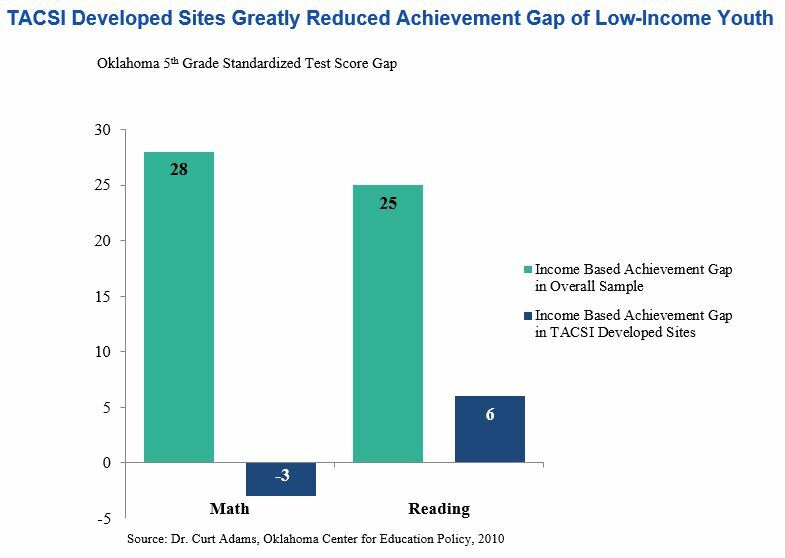 An Oklahoma Center for Education Policy study showed that in developed sites, which are a third of all locations, TACSI dramatically increased the performance of low-income students. The study shows developed sites outperformed all other schools, including those with more affluent populations.20 The chart below shows that TACSI fully closed the achievement gap in standardized math scores between low-income students and higher income peers, while reducing the gap in reading by 76 percent.21 Low-income students in developed sites actually outperformed higher income peers by 3 points in math (shown below as a negative gap) while achieving scores only 6 points lower in reading. The promising results from TACSI come with some limitations. TACSI developed sites were only a subset. In addition, TACSI faces challenges with obtaining consistent and sustainable funding, as it depends on funds from private foundation grants, Title I, and non-profit partners stretched by the ongoing effects of the Great Recession. Resource shortages have reduced available services. For example, only half of sites have a full-time coordinator and most lack unified family resource centers.22 There were also significant challenges with principal and teacher turnover, suggesting a need for consistency in building a shared vision for partnerships and services. The previous two cases provide strong evidence for wraparound services delivered at the local or regional level by non-profits or school districts. The California Healthy Start grant provides a useful example of a state level approach with diverse operating structures. If we were to adopt wraparound services statewide, we could build on existing work already in place across the state. While wraparound services are active in Massachusetts, existing programs have yet to reach the scale or the range of services provided by the evidence-based national case studies. The Massachusetts Department of Elementary and Secondary Education Wraparound Zone (WAZ) grant is one of these existing programs. Starting in 2011-2012, this grant helped districts address non-academic challenges. The goals are to enhance positive school climate, identify student needs, integrate service resources, and create district level feedback and improvement.32 The WAZ initiative provided $16,000 grants to 18 schools in Fall River, Holyoke, Lawrence, Springfield, and Worcester in the first year, and operated with up to two years of additional support.33 Lynn and Wareham were added in the 2012-2013 year. These districts were expected to supplement state funding with $99,000 from various other sources including Race to the Top, school turnaround, and local funds. The Massachusetts WAZ initiative has limitations. It excludes provision of actual services and was limited in how many staff positions could be funded. The Department of Elementary and Secondary Education (DESE) specifically prohibited grant funds from being used for direct services. The total grant of $99,000 plus $16,000 per-school typically provided support for coordinators at the school and district levels, however there were also cases of staff adding wraparound activities on top of other duties.34 The staffing covered by the grant is sparse compared to the multiple administrators and direct service providers available under models like the Children's Aid Society. The funding, assuming the average of four schools per district, is 30 percent less than the funding provided to grantees in California Healthy Start. With the expectation that localities will assemble 86 percent of the funding, the expiration of Race to the Top, and the conclusion of the WAZ grant in 2013-2014, continuation of the initiative for the handful of districts is in question. Overall, there were mixed results with implementation in WAZ schools and the districts that built services in line with case studies in the field used funding and staffing beyond the grant amount. Schools in the WAZ initiative reported successes in improving school culture, discipline, and family involvement. In some areas, the initiative has led to district-wide changes in practice and has received a level of local support that will allow it to be sustained over the long-term. However, frontline staff have expressed concerns about sustainability of the services and local partnerships after the grant funding ends. In Holyoke, wraparound service practices have taken hold, despite some initial challenges. While one school built on existing strong partnerships with the WAZ grant, another was rated chronically underperforming by DESE and was the subject of a takeover plan.35 This reflected variation in take-up in Holyoke Public Schools and a leadership transition. The current district leadership has prioritized wraparound services and, with a full-time district administrator, has expanded to three full-service community schools while introducing some wraparound elements district-wide.36 The full service schools feature a site coordinator, two school based health clinics, family liaisons, and a wide range of partnerships with community, government, and university agencies. This expansion was done with district funding, as WAZ grants only cover a part of the costs. The initiative has created infrastructure that can be sustained and even expanded based on Holyoke's decision to make further investments in wraparound services. Funding and staffing limitations remain an impediment to providing the full range of services district-wide. The WAZ initiative is only one example of active programs in the state. Wraparound service partnerships have broadened to include cross sector collaborations between non-profits, universities, and public agencies. In some cases, medical institutions have partnered with school districts to provide wraparound services. In Boston, the Children's Hospital Neighborhood Partnerships (CHNP) has partnered with Boston Public Schools to provide social workers and psychologists within under-served schools. In 2013, CHNP reached 11 schools and 1,930 students providing comprehensive mental health and wellness services. These include clinical interventions, supports for students displaying warning signs, and health promotion activities aligned with creating safe and supportive schools.39 CHNP combines delivery of these services with capacity building, including providing consultation and professional development for school staff on mental health awareness and response. CHNP has achieved positive results both on access and outcomes according to Boston Children's Hospital internal data. CHNP reports indicate that it provides mental health crisis intervention services 30 times faster than alternatives, conducts three times as many therapy sessions with students, and achieves a mental health improvement rate for children of 85 percent.40 This performance reflects the advantages of school-based services, compared to community health centers or district response teams, which by necessity serve larger populations. The strongest wraparound service models all include a clear point-person tasked with identifying, coordinating, and overseeing services. This ensures that services are sustained and that the social-emotional support responsibilities do not fall unduly on teachers and principals. Site coordinators can develop keen awareness of community needs and specific family challenges, while interfacing with administrators, teachers, and providers. Coordinators must also work closely with external partners to ensure seamless integration. Numerous wraparound service models include direct service medical clinics within schools. All high performing models profiled here feature some form of medical, dental, or vision care. Children's Aid Society of New York City specifically provides all of these within a comprehensive health center. Richard Rothstein and colleagues placed these costs at roughly $549 per student in 2014 dollars. This captures the cost of providing a pediatrician, dentist, optometrist, aides to the medical professionals, administrative support, and clinic startup costs.42 This figure includes an inflation adjustment and excludes mental health services, which are covered in the following section. It is preferable to consider the costs of school based clinics within the context of existing health systems, not as new standalone costs. However, there are notable systemic challenges with integrating school-based health services with other coverage in Massachusetts. Structural barriers impede school-based clinics from receiving traditional health insurance reimbursements if they are outside of a child's health care network. Regulatory changes along with cooperation between school districts, medical providers, and managed care organizations would assist the expansion of school-based care. A strong example of such partnerships taking hold is in Lynn, where a local community health center operates school-based clinics in nearly one-third of district schools, covering over half of the city's middle and high schools.43 The school based clinics are able to receive insurance reimbursements for services in cases where the Lynn Community Health Center is the primary care provider for a student, or where they have received a referral from a primary provider. However, there is a financial disincentive for outside providers to give referrals to school-based care regardless of the strong medical case for the services. Mental and behavioral health programs support healthy outcomes and behavior for youth while contributing to positive school climates. Such services enhance school capacity for responding to all types of mental health challenges that impede learning. Services include mental health crisis intervention, clinical treatment and therapy, outreach to students at risk of developing mental health concerns, and school-wide trainings on mental health awareness. Wellness and prevention services also contribute to a school climate of positive culture and behavior. Topics covered include healthy lifestyle choices, nutrition, stress management, anti-bullying, healthy relationships, conflict resolution, and diversity. Similar to mental health services, these may be directed at an entire school, classrooms, small groups, or individual students with distinct needs. Numerous evidence based curricula exist in the field, such as those implemented by the Boston Children's Hospital Neighborhood Partnerships. Resource centers designed to support parents and families are a key element of strong wraparound services. Resource centers can offer skill building for parents on topics such as child development, employment, GED, and English. Centers can also provide guardians with assistance in connecting to outside social service agencies. Together these services better equip caregivers with the skills and resources necessary to effectively support their children. For wraparound services to be effective, they have to engage with existing social services and the related state agencies, and measure performance on delivering results for kids. It is critical that program measures are attuned to improving areas of weakness and identifying what works. Towards these ends, district administration is included in this wraparound model. Such administrators would interface with state and local agencies and staff involved in the delivery and coordination of services, such as the interagency school liaisons under EOHHS. District wraparound administrators manage, support, and evaluate school wraparound coordinators. The role includes setting strategy and performance goals as well as providing school level coordinators with professional development opportunities and support. The total per-student cost of a wraparound services model containing the five elements discussed above is $1,312 annually. Wraparound services of this scope are not equally necessary for all school districts in the Commonwealth. All the case studies profiled here operate in under-resourced areas where many students were not otherwise receiving these important non-academic supports. For this reason, eligibility criteria should be carefully designed. One approach could be to provide wraparound supports to schools eligible for school-wide services through Title I Elementary and Secondary Education Act grants. In order to qualify for school-wide Title I support, a school must have a low-income population of at least 40 percent.54 For estimating state-wide costs, we assume that the unit of implementation is the district, since a key element of high-quality services is district support and coordination. 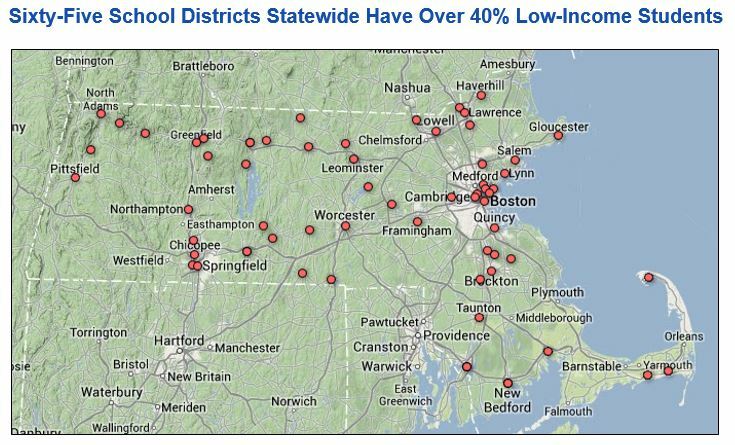 Applying this cutoff point to traditional districts across the state creates a target population in Massachusetts of 65 districts serving 356,000 students. These districts are representative of all regions of the state, including vocational-technical schools, and regional schools, and are of diverse population size and composition. The average number of students in these districts is 5,500, with a maximum of 54,000 students in Boston. There is no exact science to selecting a cutoff point. For example there are several Gateway Cities with populations of between 34 percent and just under 40 percent low-income students (Attleboro, Barnstable, Peabody, and Westfield). 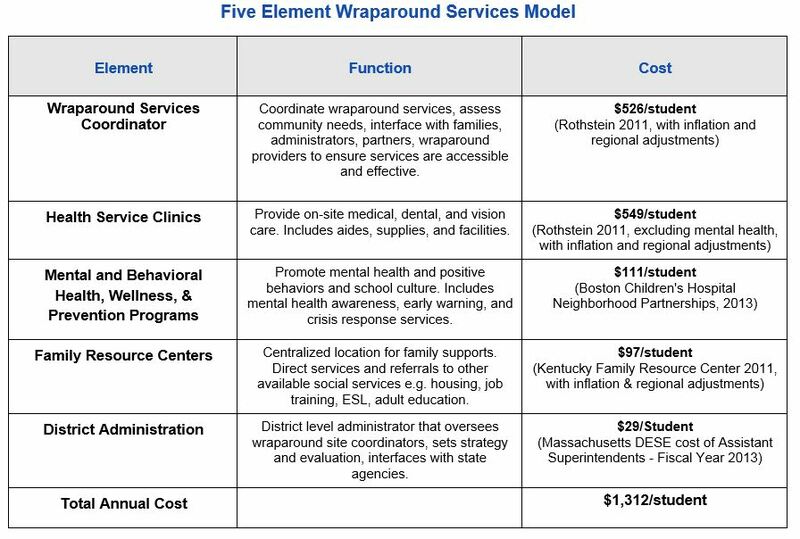 Under these assumptions, the full cost of statewide wraparound services is roughly $468 million. Utilizing the average student population of 5,500, the average cost of implementation is $7 million per-district. These estimates do not consider existing services that could be coordinated or current partnerships in schools; therefore they do not necessarily represent new spending in these areas. A key example of this is school-based health care. In this case, shifting existing healthcare spending on kids to school-based clinics could greatly reduce any net additional cost. Massachusetts could share the costs between the state and localities to ensure the feasibility of the five element wraparound services model and to facilitate the creation of local partnerships. The matching formula could reflect the Commonwealth's Chapter 70 education formula that takes into account diverse need and ability to pay at the local level. This would create diversity in the amount that cities and towns would contribute. Alternatively, Massachusetts could adopt a system similar to California's Healthy Start grant by requiring that municipalities gather a set percentage of the resources locally. This approach has the downside of not taking into account localities' differing ability to pay. Either form of matching should include local district or municipal spending, state and federal grant funds, and private sources of funding or in-kind services from partners. All resources dedicated to services under the wraparound umbrella should be eligible towards matching. Regardless of whether a matching system is used, existing partnerships and services should be included in building comprehensive wraparound supports. Identifying existing services should be included as a condition of eligibility for additional funding. Identification of related services would help ensure that state funds are used to initiate supports that do not currently exist at the local level while integrating what is already working. Confronting students' non-academic or social barriers through wraparound services has been shown to be effective across the country. This approach holds potential for Massachusetts. Wraparound services covering the five elements described above would greatly broaden the range of school-integrated services available to thousands of children and families across the Commonwealth. While wraparound services assist in creating the conditions for learning, the necessary complement to these supports is highly effective schools with engaging and rigorous academics. When combined, these building blocks can create a foundation for academic and social progress, particularly in under-resourced areas, helping students from all backgrounds receive a quality education. Sufficient time and planning are necessary to build wraparound services at district or statewide scale. Among the national case studies, numerous examples were created and refined based on experience over multiple decades. Each community has unique strengths and challenges. Community partnerships designed to build on strengths and address challenges must reflect the input of all local stakeholders and incorporate the feedback of diverse community members and professionals, who may be working together in unprecedented ways. All of these tasks require ongoing collaboration, feedback, and improvement. The 3-year timeframe of both the California Healthy Start and the DESE Wraparound Zone grants is a reasonable estimate of adequate time. Evaluation of results throughout the process will help ensure that progress towards positive outcomes for youth and families – as well as potential impediments to success - are identified. These services have the potential to improve a broad set of family and youth indicators, in addition to improving traditional academic measures such as standardized test scores. Many of the initial effects are on mental health, physical health, family stability, and access to services. Growth in these areas can in turn promote academic success. The means by which this positive cycle can best be initiated are as unique as each community and family. It is important to consider the interaction of wraparound services with existing state efforts to support youth and families. Particularly, the interaction between school-based medical services and existing health coverage is a critical point of alignment. Services directed at mental health, safe and supportive schools, existing school counseling and nursing, family access centers, and other initiatives should be incorporated into a unified, intentional, and holistic system of support for youth and families. 2 Note: In the field of behavioral/emotional health the term wraparound services is often associated with intensive community integrated services and supports for youth with significant challenges. The concept of wraparound services in the education field has commonly taken on a broader meaning. This common definition includes behavioral health but covers entire schools, includes a wider range of services, and encompasses serving youth with less acute needs. 3 Blank, Martin J., Atelia Melaville, and Bela P. Shah. Making the Difference: Research and Practice in Community Schools. Coalition for Community Schools, Institute for Educational Leadership. 60 Harding, Megan, Holyoke Public Schools, Full Service Community Schools Director. Phone Interview. June 27, 2014. 37 Allard, Barbara, Fall River Wraparound Zone Coordinator. Phone Interview. June 26, 2014. 38 Allard, Barbara. Fall River Wraparound Zone Coordinator. Phone Interview. June 26, 2014. 39 Feigenberg Falk, Luba. "Children's Hospital Neighborhood Partnerships: Reaching Children Where they Live and Learn Annual Report 2013." Boston Children's Hospital (2013). 41 Rothstein, Richard, Tamara Wilder, and Whitney Allgood. "Providing Comprehensive Educational Opportunity to Low-Income Students: How Much Does It Cost?" The Campaign for Educational Equity, Teachers College, Columbia University (2011). 20. 42 Rothstein, Wilder, and Allgood, 26. Note: The study estimate of $542/year per student for health services was used as a baseline. There were a few adjustments. $24 for mental health services was taken out, leaving $518/student. This figure was inflation adjusted from 2010 to 2014. Finally, the resulting figure was discounted by 3 percent, reflecting lower costs in Massachusetts compared to New York City, using the Consumer Price Index from the first half of 2014. This produced the result of $549/student. 45 Dennery, Shella. Budget Documentation from Boston Children's Hospital Neighborhood Partnerships (2014).